Research plays an important role in the European Parliament. That’s because it can help Members of the European Parliament (MEPs) and stakeholders scrutinize proposals from the European Commission, the ‘government’ of the EU, examine pressing issues of the day and pass laws. The societal challenges that they deal with are increasingly complex, so policy makers need to rely heavily on new, reliable and accessible knowledge. At the same time, getting research into parliament is important for individual researchers. It’s one of the ways to demonstrate the societal impact of their research, which is high on the agenda of universities and research funders and will be even more important in the years to come. Governments are also increasingly asking higher education institutions to show how public money spent on research improves society. So, what are the different ways in which research can enter EU parliament? 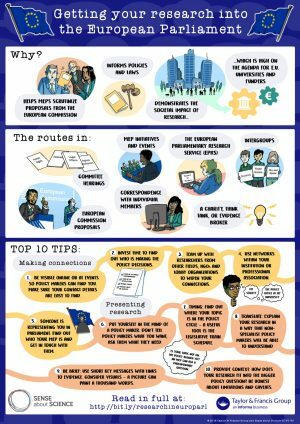 What steps can you take to help your research influence EU policy matters? Read a how-to guide to getting your research into Parliament, brought to you by Taylor & Francis and Sense about Science. If you’re a researcher interested in UK policy then you should also check out our guide to getting research into the UK Parliament. What are the routes into the European Parliament? A lot of the work that is done by the European Parliament is organized in thematic committees. These are cross-party groups of Members (MEPs) that scrutinize legislative proposals from the European Commission. Most committees organize regular hearings, to hear from experts and hold discussions on the key issues. Parliament’s administrative services, political groups or individual MEPs can suggest experts. When an individual Member wants to put a topic on the policy agenda or stimulate an in-depth discussion, they can organize an event, which is open to the public. In these events generally one or more experts have the chance to explain the available scientific evidence in more detail. Another tool often used by MEPs when confronted with new evidence, are parliamentary questions. These are questions MEPs address to other EU Institutions and bodies. They are a direct form of parliamentary scrutiny. The EPRS is the in-house research department and think tank of the European Parliament. It assists MEPs and parliamentary committees by providing them with independent, objective analysis. One of the things the EPRS does is produce briefing papers on research, placing findings in a policy context. The EPRS also provides impartial information for MEPs and their staff through a confidential, one-to-one inquiry service. The EPRS supports the Parliament’s Panel for the Future of Science and Technology (STOA) and hosts the European Science-Media Hub (ESMH). Intergroups can be formed by MEPs from any political group and any committee, with a view to holding informal exchanges on particular subjects and promoting contact between Members and civil society. They exist on a wide variety of areas, from children’s rights to ‘Sky and Space’. Intergroups are generally supported and organized by an NGO or advocacy group. Intergroups meet to discuss, campaign on and promote particular issues. A register of Intergroups is regularly updated. Some, but not all Intergroups have their own website. The European Commission is responsible for planning, preparing and proposing new European legislation. This is called the ‘right of initiative’. Most of the evidence used for investigating a societal problem and for comparing different policy solutions, will be gathered by the European Commission. An important way to gather such information is through public consultations. The ‘Have your say’ website can help you stay up to date with these. These aren’t the only routes by which research enters into Parliament. Other paths include: via correspondence with individual Members or their staff, through meeting at events, and via a third party such as a charity, think tank or evidence broker. Be visible. Be seen online or at events, so that policy makers can find you. Use twitter or write a blog. Make sure your contact details are easy to find. Find the movers and the shakers. If you want to influence policy, you have to invest in finding out who is taking the policy decisions. Policy engagement is a long-term process, not a one-time activity. Sign up for public consultations and newsletters from the EU institutions, your national Academy or scientific society and relevant NGOs. Follow policy makers and MEPs on twitter, go to events. Find your allies. Many NGOs and lobby organizations are well connected and can introduce a new expert. Team up with other research fields, such as economists and behavior scientists. Use networks. Find out if your institute has an outreach officer or even a Brussels office. Contact the policy officer of your scientific society or professional association. Find your MEP. Someone is representing you in the EU. A lot of MEPs are very keen to hear from constituents so find out who your representative is, or contact an MEP who you have affinity with and build a relationship. ‘So what?’ Put yourself in the mind of a policy maker. Why should a policy maker care? What is the policy problem that your research can help to solve? Don’t tell policy makers what you want, ask them what they need. Find out where your topic is in the policy cycle. A useful tool is the legislative train. Is the European Commission writing a proposal on this theme? Then respond to the public consultation. Is your topic not on the policy agenda yet? An MEP can ask a parliamentary question. Don’t expect policy makers to understand your research. Try instead to understand the policy making process, so that you can tailor your research for the policy context. It may take some effort, but policy is easier to understand for you than your research is for politicians. Be brief. Use short key messages, referring to more substantial evidence with links. Or use visuals: a picture can paint a thousand words (and save time and space). Provide context. Your research will never respond to the entire policy question, so try to understand the bigger picture of the problem that your research is looking at. Be honest about limitations and caveats. Sense about Science supports early career researchers across Europe to play an active role in public discussions about science. Do you want to get involved in one of our campaigns or join a workshop? Then sign up for the Voice of Young Science network. Are you interested in influencing UK policy? Then read our guide on getting research into UK policy. We’d like to thank the Joint Research Centre, the European Science Media Hub, the EP Research Service and SAPEA (Science Advice for Policy by European Academies) for contributing to this guide. Special thanks to the people who have answered specific questions, provided feedback over email or at user testing as we developed the guide: Hannah O’Kane, Hannah Behrens, Didier Bourguignon, Andrew Flagg, Rory Kelly, David Mair, Milena Raykovska, Susanna Streubel, Svetla Tanova-Encke, Imogen Tyreman, Toby Wardman. What can the media do for researchers? Is academia fairly portrayed in the press? How do early career researchers ‘publish and thrive’?